Envoys from the United States, the European Union, the United Nations and Russia will meet later this month to discuss the next steps to address the Israeli-Palestinian Arab crisis, officials said Thursday, according to AFP. The gathering of the group, known as the Middle East diplomatic quartet, will take place January 26 in Brussels to discuss ways of reviving the peace process after the Palestinian Authority failed to win UN Security Council approval of a resolution on forcing Israel to withdraw from Judea and Samaria. 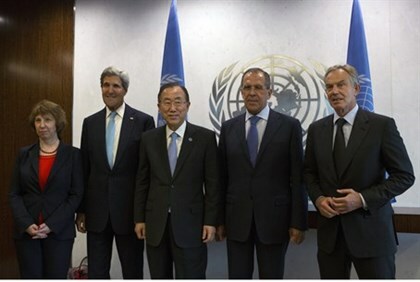 “The Quartet envoys will meet at the end of this month to discuss the way ahead,” U.S. Ambassador Samantha Power told the Security Council. The 15-member council last month rejected a resolution on Palestinian statehood that set a 2017 deadline for an Israeli withdrawal from Judea and Samaria. The United States and Australia voted against, but China, France and Russia were among eight countries that backed the resolution, leaving it just one vote short of the nine required for adoption. Following the vote, the European Union’s (EU) foreign policy chief, Federica Mogherini, stressed the need for Israel and the PA to urgently resume peace negotiations. The vote “underlines once again the urgency of resuming meaningful negotiations between the parties and the need for the international community to focus on concrete achievements” to reach a final settlement, Mogherini said in a statement. The Quartet has been unsuccessfully trying for several years to force the sides to resume peace negotiations. In 2011 the group suggested a timetable which it said would bring forth a peace agreement by the end of 2012, but this initiative failed as well.